Locational Advantage : Rambagh Palace is close to the main shopping area of Jaipur. The Rambagh Palace is an architectural masterpiece that's elegance personified. The hotel was once the residence of the Maharaja of Jaipur. The palace is situated in the heart of the city, close to the main shopping areas and historical monuments. 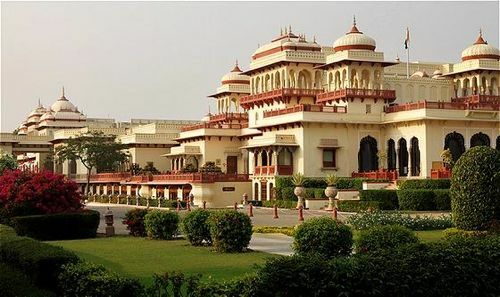 Hotel Rambagh Palace has 90 rooms including 12 Historical Suites, 3 royal suites and 3 Grand Royal Suites that allow guests to relax in the lap of regal luxury. Superior Rooms: These are spacious rooms, tastefully decorated in traditional Rajasthani style and offering a view of the garden. Luxury Rooms: Each room has a unique theme. Historical Suites: Exquisitely designed with decor befitting royalty. Royal Suite (3): Few of these suites have been the personal chambers of the Maharaja of Jaipur. The beautiful architecture of these suites along with the d?cor and the artifact take you to the bygone era of the Royalty. Grand Royal Suite (3): Each suite has been exquisitely designed with beautiful views of lush green gardens, some with their own fountain and terrace. These Suites are perfect for dignitaries, celebrities, heads of state and those seeking ultimate in luxury and extravagance.